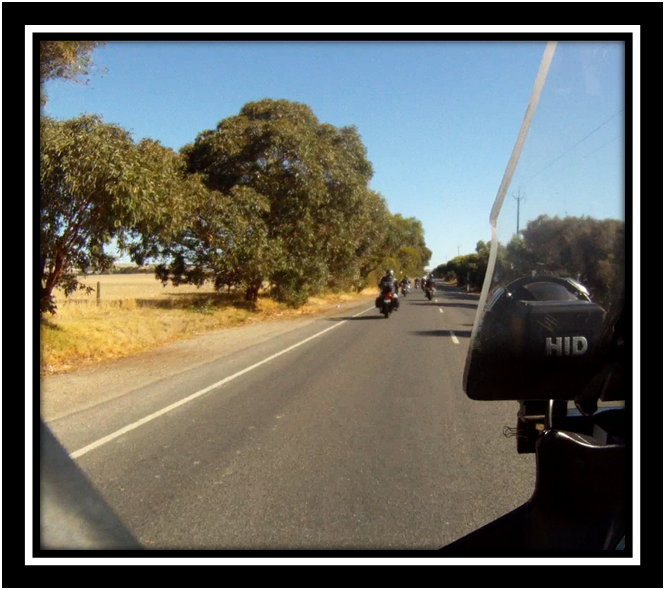 Went for another ride with the OFMG from Goolwa. They go out regularly every Wednesday for a coffee in the morning and then stop somewhere for lunch and then head back to Goolwa for another coffee others will have a beer or 2. Personally I don’t drink at all while driving or riding. To easy to make a mistake. 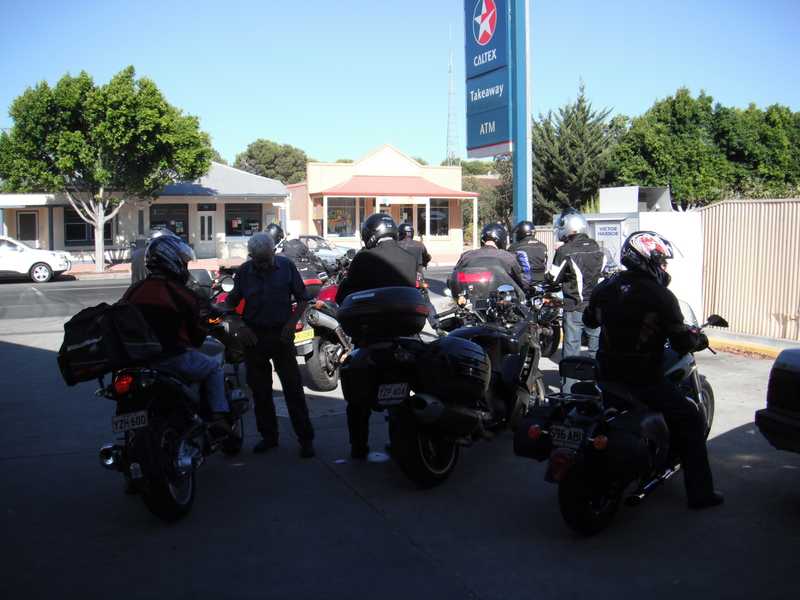 Everyone meets at the Caltex service station before 10am for 10am departure. 17 bike started the day. We left Goolwa to the north and headed for Meadow. Meadow is a nice little town that services the local community and some tourism that passes through. I have tried something a bit different with this ride. Rather then taking photo’s as I normally would I fitted my Gopro to the front of my bike and to my helmet and from the footage taken I done screen dumps of a few sections. We stopped at a small cafe and enjoyed coffee. The people working in the cafe’s must dread it when they have large groups turn up to order coffee and cake all at once. But they done a great job. Even got a coffee for John. Who John was nobody knew. So they took the extra coffee away. This is not what I normally do when I go for a ride. I tend to leave at 6am and I wear a Camelback to quench my thirst on the road and only stop to refuel. So spending time in the one spot and chatting is a little foreign to me. 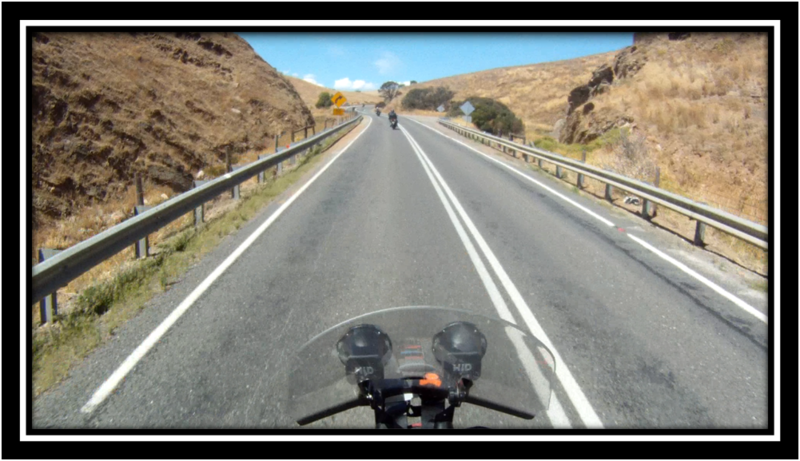 We then left Meadow and headed west to ride around Myponga reservoir. I had only recently ridden around here but I didn’t mind doing it again. There are some great bike rides around this area. We then headed towards Yankalilla to the hotel for a counter lunch. I had prawn skewers and salad. At $12.90 it was great value. The waitress came back after we had eaten with some vouches. Buy 1 meal and get the second at ½ price. Has to be used by the end of April though. May take my wife through sometime. A couple of the chaps shared a bottle of Red. I stuck with my glass of lemonade. I was warned that these 2 chaps ride a lot more aggressively after lunch but I didn’t see it. One of them is 84 (and ½ he informed me) so I was hoping he wasn’t going to ride to aggressive. I wouldn’t be able to keep up. 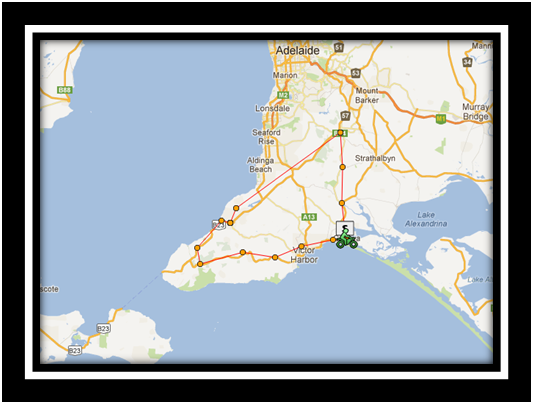 After lunch we headed south and then turned east back towards Victor Harbor. We went out the back of Victor to bypass the town traffic. Then headed for Signal point in Goolwa. There we went to Cafelicious for another Coffee. (I was about full up with coffee by now) Oh yeah and the 2 red wine drinks, opt for Beer. Day is at an end for me so I head home. I’m not real happy with the photo’s and think while I may still fit the Gopro to my bike I will still take normal photo’s with my camera. Always interesting riding with new people. They sound like an interesting crowd. I’m with you on the choice of beverages though. It’s too easy to make a mistake on a bike and you need all your wits about you. Why slow your reactions down? Was a great ride out. I will be a regular rider with them. Well once a month when I’m home and not doing something with wife.